The residents of Lake Nona are proud of their reputation of being forward-thinking, innovative, and viewing the world “outside of the box.” Therefore, it’s no surprise that many parents of pre-K through fifth-grade students will be making the 30-minute drive to our neighboring town of St. 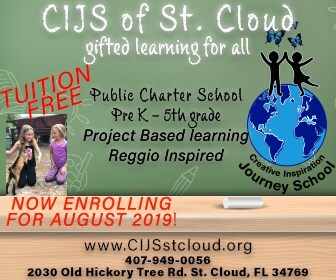 Cloud this fall so that their children can experience the Reggio-inspired curriculum of Creative Inspiration Journey School (CIJS). Currently under construction and scheduled to open this fall, CIJS of St. Cloud is conveniently located on the corner of 192 and Old Hickory Tree Road, just moments after turning off Narcoossee Road. This tuition-free public charter school features an early education program that is inspired by Reggio Emilia, a city in Northern Italy, and is one of the top 10 curriculums in the world. This unique educational approach makes this institution in St. Cloud one of the most innovative schools in Central Florida and includes project-based learning, thrives on creativity and imagination, and encourages self-discovery and critical thinking while establishing an environment where children love to learn! What makes CIJS the most innovative in Central Florida? Marquis answered, “I would say the Reggio philosophy is so unique because they believe there are 100 different ways to learn. And, so, it’s a very hands-on atmosphere … and there is mutual respect between adults and children. That doesn’t mean that children get to ‘rule the roost,’ but it does mean that they get to take part in their learning. So, as we see that they are interested in a particular topic, we use that as a unit within the classroom.” That educational philosophy coupled with Marquis’ experience in the public schools creates the perfect combination because she understands the importance of balancing data-driven learning and having milestones and goals while integrating with the project-based learning and the Reggio approach. I was so intrigued by this inspiring curriculum that I continued to ask Marquis several questions, almost wishing my kiddos were still little enough for such a great experience. 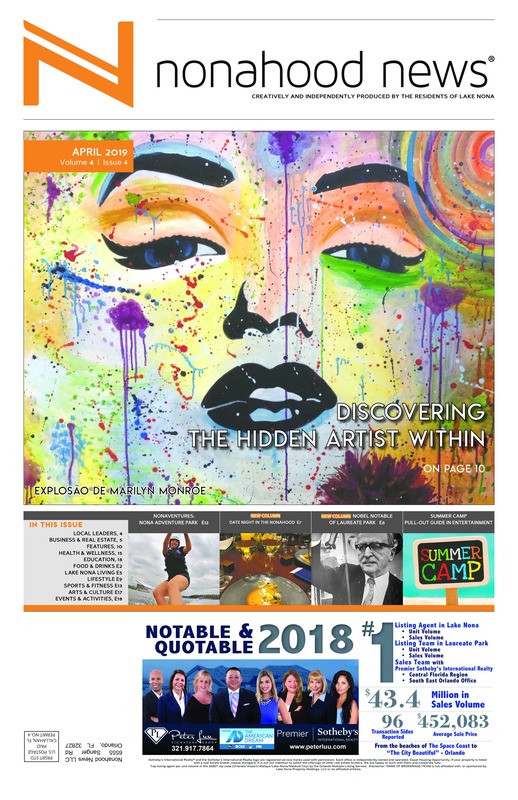 Nonahood News: What does learning “through self-discovery, imagination, and creativity while interacting with others in a friendly and safe atmosphere” look like? Describe a typical day in the life of one of your students. Patricia Marquis: In a typical day at CIJS, there is a lot of exploration. Every class is utilizing the standards, and they’re integrating them into the subject areas. So, while all the teachers have the same big ideas, (for example, living/non-living, solar system, whatever the big topic might be) they can use those standards a thousand different ways. For example, in [a] living and non-living [unit], let’s say that the kids are interested in butterflies in one class, but the kids in the other class are interested in tadpoles and frogs – well, that’s okay. You can take those same standards and integrate them into these projects in different ways. So, each classroom you walk into is going to look a little bit different. We had a couple of teachers who both did dinosaur topics and the projects went into two completely different directions, which gives the kids an opportunity to think about what they’re interested in and what direction they want to head, and it also allows them to explore throughout their learning. One teacher decided to teach voting, and the class wanted to figure out what they wanted their class pet to be. The kids voted and decided they wanted to have a dinosaur as a class pet. So, they talked about which dinosaurs they really liked, they got a chance to measure the room to see how big the dinosaur was and determine if it was going to fit in the room. They started talking about the idea of carnivores and herbivores and which one they thought would work for them, and they decided they didn’t really want a carnivore because their dinosaur pet would eat them. Then, as they’re going through this, they decided the dinosaur with horns wouldn’t work because that was going to poke them. And so, you can see all the learning that came from that. They’re literally analyzing their environment and considering what would work for them. This went on for weeks. And the teacher integrated science concepts and social studies concepts as they were measuring and talking about the history of dinosaurs and where they came from. These kids got personally involved in this and researched it themselves. Of course, that was guided [by the teacher] contingent upon the answers of the kids and what the kids were excited about as they engaged in these conversations. cover their math, science, social studies, reading and writing standards. Both classes were learning about dinosaurs. And both classes were learning the standards. It does take a lot of training on our end, and flexibility and openness for the teachers. You see a teachable moment, use it, and it’s okay, and then we can come back to what we were doing. NHN: Since so much of this is driven by what interests the students, how do you train your teachers to work with, for example, a quiet student who doesn’t seem to be as involved or engaged as the rest of the class? PM: I think part of what we do that is also so important is getting to know our students. So, if we know that a student is quiet, we know that we’re going to be pulling information out of that student in other ways. It really goes back to knowing your students. And it goes back to the mutual respect. This really creates a different kind of environment. Our behavioral issues die because kids are so engaged in what they’re doing. NHN: What is generally your child-to-teacher ratio in the classroom? PM: It’s the same [state standards]: K-3 is one to 18, for our VPK class it’s a two to 20, and our fourth- and fifth-grade classes are one to 22. Those are state standards. NHN: Why do you feel it is so important to instill a love for lifelong learning in every child you work with? PM: For multiple reasons. I think kids need to really enjoy what they’re doing, just as we do when we choose a career. I think it’s hard to get through our lives if we’re doing something that we’re not enjoying. I think, too, that it’s really important for the kids to learn social skills and group cooperation skills because, as they get into the workforce, there’s so much collaboration that’s involved, and if you haven’t learned and spent time working through the idea of collaboration, you don’t know how to do it. NHN: You can only accept through 5th grade. How are your 5th graders being prepared for education outside of CIJS? PM: We get that question often. I think that is easy for our students because what we’re doing is giving them the tools to learn in any environment. They’re going to be able to be successful no matter what. Because their thinking is so different, typically they’re labeled “gifted.” We’re using the type of curriculum that is utilized in gifted instruction and teaching all of our students through that same manner. And, so, they’re very successful in any environment. NHN: What is the process for an Orange County resident to apply for the “out-of-county” lottery drawing for admissions? PM: They just need to go to our website and upload the materials stating that they live in the state of Florida. There is also required documentation that shows residency. The way we do it is we have to choose in-county residents first. However, we’ve already had our main lottery drawing, which took place in February. Now we’re having weekly lottery drawings from here until school starts [or we reach our capacity of 500 children]. Which means that in each one of those weekly lottery drawings, we’ll first pick in-county and then, out-of-county residents. So, the sooner someone gets registered, the better. Things are really picking up, so my suggestion would be that they get in and get enrolled because there is going to be a wait list, I promise you that. NHN: Your curriculum includes a minimum requirement for parent involvement. How does this work for families who have both parents working full-time, or for non-traditional families, such as foster or guardian situations? PM: It can be anybody in the family who wants to help support, it can be grandma, grandpa, aunt, uncle. They can also do things from home, and there are things we can send home. We have [for volunteer hours] the ability to help us when we get ready to move all of the furniture from the warehouse into the school – they can take a weekend, and come on and help. We’re going to have events – the fall festival, the spring expo – so, they can participate in that if they want to come help set up or be a volunteer, so there’s a lot of ways that parents can participate. If they want to sew curtains for us to put in our windows so it looks like a living room, yes, we need things like that. Reggio was built on community and collaboration between the students and the educators and the community itself. CIJS opens this August, is now enrolling, and is tuition-free. Affordable before- and after-school programs are also available. CIJS will have a free information seminar on Saturday, April 27, at noon at the Veteran’s Memorial Library in St. Cloud in the Fisk Room (810 13th St., 34769). To apply for enrollment, go to www.CIJSstcloud.org/#lottery_application. You can also email charterschool@CIJSstcloud.org or call 407-949-0056 for more information. Whether you plan to enroll or not, if you want to show your support, CIJS is looking for the following donations: www.CIJSstcloud.org/#donate_items.